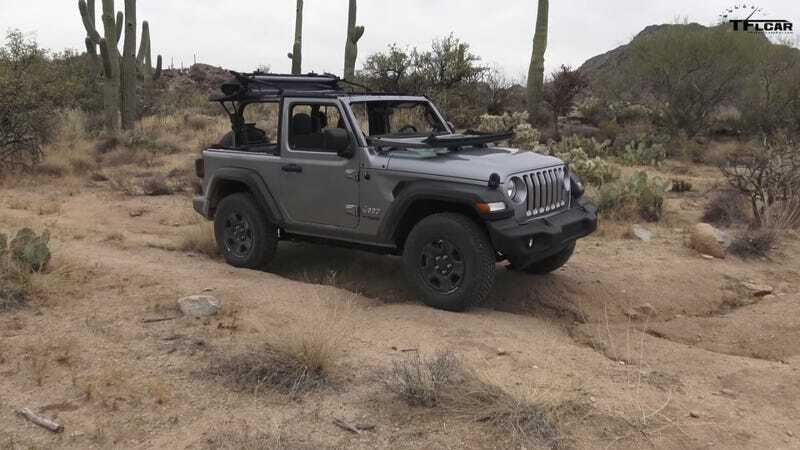 If you’re familiar with Jeep’s long running JK-generation Wrangler, you’ll know that it’s quite difficult to fold the windshield if you want to go proper off-road spec. For the new 2018 Jeep JL, they’ve remedied that, and made it quite simple to not only remove the roof, but fold the windshield forward in just about 5 minutes. You’re going to see a lot more Wranglers with the roof off in the near future. This short video from The Fast Lane Car shows just how simple the top removal process is with the new truck. The process begins with the simple folding soft roof mechanism. Jeep has made the process easier by taking away the zip out rear window (the Jeep representative uses the term “back light”) and replacing it with a new press-and-seal slider style that reminds me of a plastic sandwich bag. From there the top basically just folds backward like a traditional convertible top, storing itself stacked on top of the rear quarter. From start to finish, this top finagling was under a minute and a half. From there, the windshield is a little more difficult, but only barely. The Jeep comes with all of the tools needed to drop the windshield. First you remove the wipers with a single nut and a wiggle. Then, sliding inside the passenger compartment, there are four bolts holding the windshield to the pillar, easily removed. Pop the windshield forward, and then it rests on the hood. An interesting piece to note is the integrated footman loop/windshield rest/washer nozzle. Then there are a pair of hooks with a velcro strap to keep the windshield from bouncing around on the trails. In under four minutes you can have your windshield down. 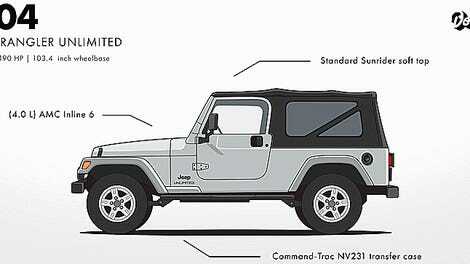 I’m confident that the process could even be done in less time, as the Jeep representative spent a good bit of time discussing the process of top removal and touched on a few design components. It certainly looks far easier than the hour-long process that the JK Jeeps involved. The only problem here is that the JL Wrangler doesn’t look particularly good with the windshield out and the soft top stacked up on the back of the truck like that. It’s an ungainly solution that trades simplicity of design and rugged good looks for ease of use. Many JL buyers will appreciate that trade off.